Every Tuesday at my school, we have Tech Tuesday. Every teacher has to go to a tech session where the tech department talks to us about a new app that we should be familiar with. So far this year, we've learned about Explain Everything, Socrative, iMovie, and Book Creator, just to name a few. The general idea is to be able to take a picture of post it notes and be able to transport them and organize them. So, if you are in a meeting or just have a big bunch of post it notes on your wall, you can take a picture of them in the app and THEN…. wait for it… move them around in the app! How am I envisioning using this in class? …for matching or ordering activities. For example, I was thinking of using it in my geometry class for students to match area formulas to shapes. In calculus, I was thinking of using it for students to match trig functions to their derivatives. For my girls, I was thinking of having them put the numbers from 1 - 10 in order. So, the first step is to write some things on post it notes - who doesn't have a million of those laying around? Different colors? Yes! I decided to try this using geometry formulas. 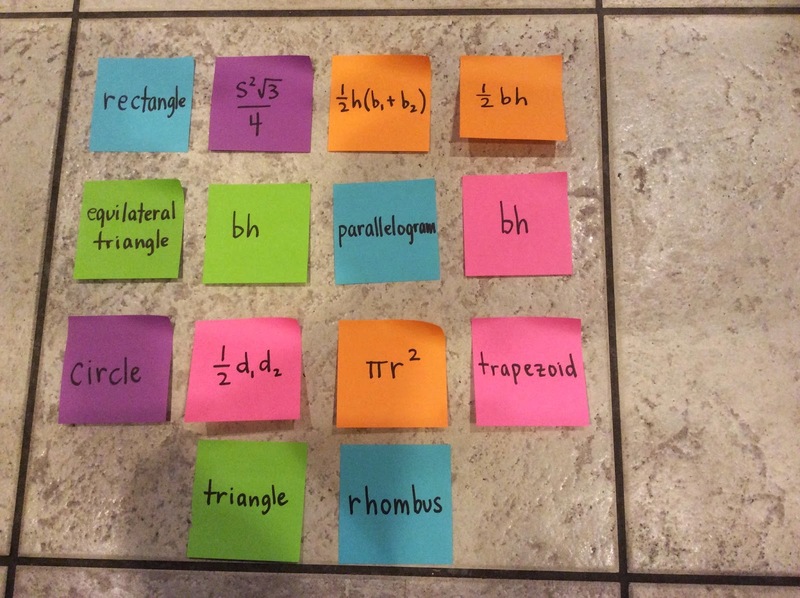 So, I wrote some of the different formulas and their corresponding shapes on different color post-it notes that I had laying around. Here is a picture of the post it notes on the floor of my kitchen. Here is a picture after I imported them into the Post It Notes App. I think that the app recognizes the post its very well! 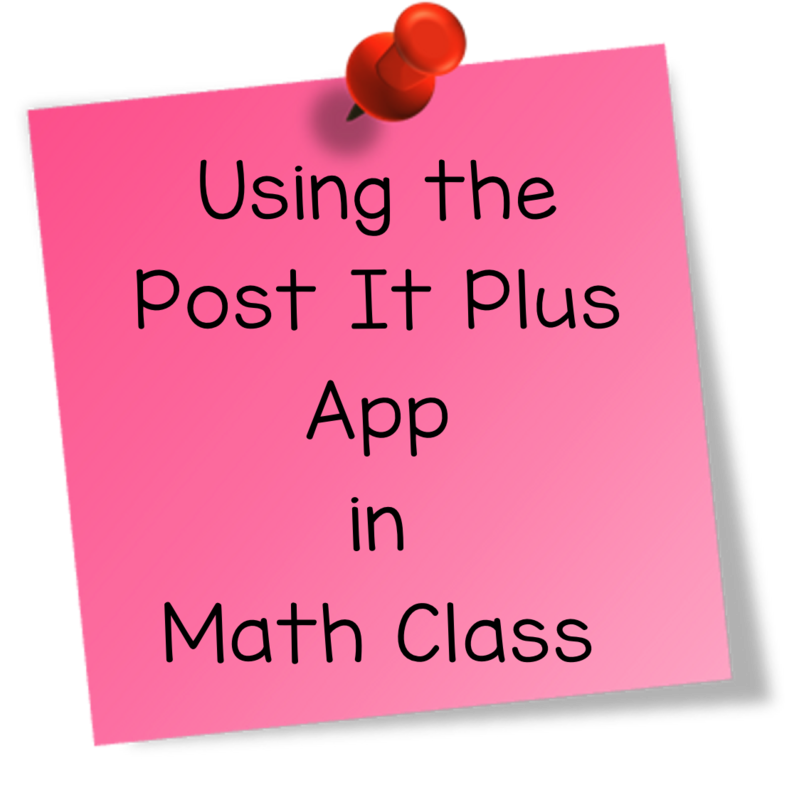 Note that you can only use square post its - according to the directions in the app, the app will not recognize other post it shapes - they will be made into square post its. I used black marker to write on the post its…I wonder how regular pen or pencil would work? I will have to try that. Finally, I want to see how I can grade this. I want to see how the students can send it back to me. and then they choose to export the file in pdf format back to me through email. My only problem was, how do I know whose is whose? I wanted them to somehow put their name on it, so everyone could get credit for their own work. I believe that the students could submit this through a classroom management system such as Showbie also. But, we didn't try that yet. I don't know about you, but I hate having the students submit things through email…I hate having all of those emails to sift through. Still working on that one, but I call use the Post It Plus app a success!